This hotel features rooms with iPod docking stations and free WiFi. 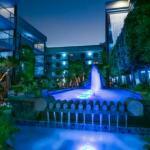 The property offers a limo airport shuttle service and is within 5 minutes' drive of Apple Headquarters. Rooms are equipped with luxury bath products and bathrobes at the Cupertino Inn. The rooms also have minibars and modern dark wood furnishings with white and red bedding. Guests are provided with a daily breakfast and evening cocktails with hors-d'Å?uvres at Cupertino Inn. The inn also has an outdoor pool and hot tub. Cupertino Inn offers easy access to Interstate 280. Stanford University is within 20 minutes' drive of the property.